Poor Dougal came into the care of Bracknell & Wokingham Districts Branch after his owner died. He had faeces in his fur and was and infested with fleas, needed 12 teeth removing, and one of his claws had grown so long it had entered the footpad, becoming infected and bleeding. He had some dental work carried out and a groom, but otherwise the vet said that he was in good health for a 20-year-old gent. Dougal was placed in the care of fosterer, Kelly, who discovered that he was a delightful and affectionate cat. In exchange for supper he offered great head bumps and affection. He had an adorable purr, he seemed to purr even when he was sleeping! 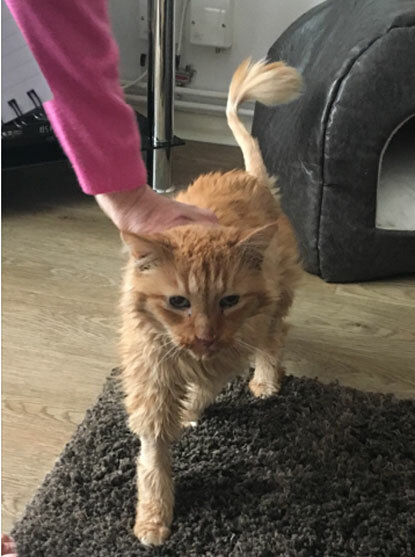 It wasn't long before homing officer Debbie received a phone call from a lovely lady, Linda Evans, who spotted Dougal after using the Find-a-cat search on the national Cats Protection website. Linda sadly lost her own cat Joe, aged 22 years old, in February, and when she saw Dougal she knew she wanted to give him a loving home for the rest of his life. She commented that he looked very withdrawn. “I wanted to give a home to an older cat because they often get overlooked,” she said. When Debbie confirmed that Linda could adopt Dougal she was thrilled. 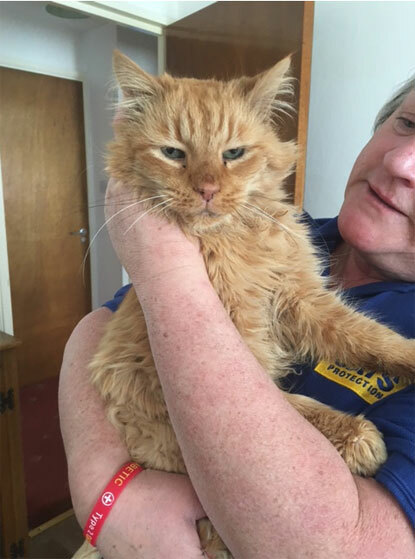 Dougal is settling into his new home well and we hope his story encourages others to give older cats a chance! A beautiful story, a beautiful cat! Just seen Dougal on Facebook and I'm sure we all wish him a happy retirement.